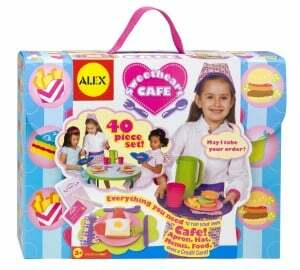 Today only, Amazon is offering a 40 piece Pretend & Play Sweetheart Cafe set for $17.58 (regularly $43.95). You can click here to view the deal. You can also get free shipping with Amazon Prime or free super saver shipping when you spend above $35. As a price comparison, the same one is going for $24.99 at Toys R Us. Also if you’re interested, Amazon is also offering 60% off more Alex toys today. You can click here to view their selections.